Dongguan Precision Lemo Metal Products Co.,Ltd is a professional manufacturer, who specializing in development, design, manufacturing and sales of precision OEM metal parts since 2002 in China. We have the strong capacities for precision CNC machining, Turning, Milling, Stamping, Casting, Sheet metal fabrication industries field. Our precision metal components are widely used in Aerospace, Automotive, Medical, Military, Instruments, High-speed rail, Communication, Electronic, Packaging and so on. The world famous BUICK & CADILLAC automobile, CASC aerospace, OMRON medical, DELL computer, Samsung and Microsoft, are some of our main long-time partners. Using kinds of material as Aluminum alloy, Stainless steel, Tool steel, Carbon steel, Brass, Plastics, Iron, Carbide, and other special materials. The main processing technology included CNC machining, Turning, Milling, Drilling, Grinding, Polishing, Knurling, Wire EDM, Stamping, Casting, Forging, Welding. As well as we can provide the various surface treatment for the parts, such as :Anodizing, TiCN / Zinc / Chrome / Nickel coating, Oxidation treatment, Nitrided, Passivation, Polishing, Sandblasting, Phosphating, Anti-corrosion. 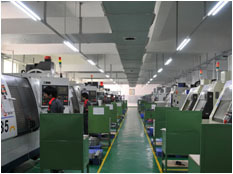 Important, we have a high-skilled engineering team with 12 years’ rich experience for exported to the world 60 countries; over 4000 square meters production workshop; Advanced producing and inspection equipments; More than 40 CNC machining centers for 3-Axis,4-Axis,5-Axis,multi-Axis machines and other ancillary equipments. All in all, we can meet the increasing and higher requirements for our different level customers. Future, we always implement the quality management system ISO9001:2008 and ISO/TS16949, and promise to supply high quality products and better full services to every client.